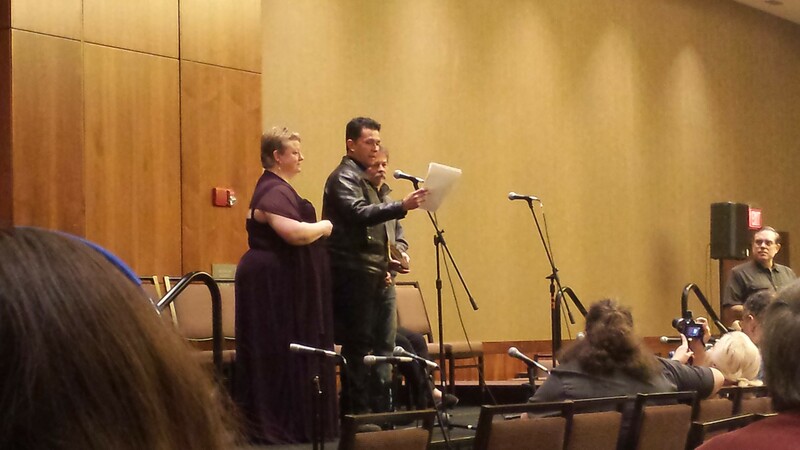 Each year at Boskone, the New England Science Fiction Association (NESFA) announces the winner of the Gaughan Award for Emerging Artist and the Skylark Award. The awards were announced as part of the Saturday evening program. The Gaughan Award honors the memory of Jack Gaughan, a long-time friend of fandom and one of the finest SF artists of the 20th century. Because Jack felt it was important to encourage and recognize new blood in the field, The New England Science Fiction Association, Inc., presents the Gaughan Award annually to an emerging artist (an artist who has become a professional within the past five years) chosen by a panel of judges. This year’s winner of the Gaughan Award is Sam Burley. 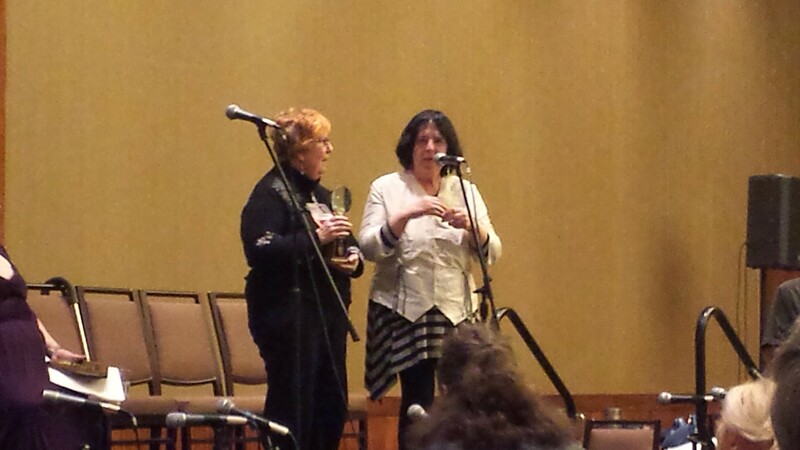 Ginjer Buchanan accepting the Skylard on Robert J. Sawyer’s behalf with cautionary tale from Jane Yolen. The Edward E. Smith Memorial Award for Imaginative Fiction (the Skylark) is presented annually by NESFA to some person, who, in the opinion of the membership, has contributed significantly to science fiction, both through work in the field and by exemplifying the personal qualities which made the late “Doc” Smith well-loved by those who knew him. This year’s winner o the Skylark Award is Robert J. Sawyer. He is a Hugo and Nebula Award-winning Canadian science-fiction writer, author of 22 novels including FLASHFORWARD.